Today we are starting the second week of BM #16, I have chosen to do a combination of Indian Thali for my Mela along with couple more themes. The thali that’s showcased today is something that’s very sweet and dear to me. This happened couple of weeks ago even before I extended the Thali Mela date. It was on Akshaya Tritiya and I was supposed to eat at office, while Amma said she will call everybody else for lunch. It so happened that we had power shutoff at office and my lunch got disappeared before I could even think about it. I returned home and was welcome with a feast. Only then I realized it was a festival and Amma had pooja. By the time we sat down for lunch, it was pretty late and looking at my plate, I almost wished that I had taken time to click a picture. Knowing that getting up at that time get everybody’s wrath, I thought to myself that I must recreate that thali someother time. Imagine my surprise when Amma asked if I saw the pictures. I couldn’t understand what she was talking about. Only then hubby dear very sheepishly confessed of taking thali pictures. I was so touched, and even more happy when I saw that Daddy had decorated the pictures with fruits, as it was Akshaya Tritiya. The entire thali was one detectable feast and Amma had made quite a few new dishes. I was only glad that I got my whole family hooked on clicking food pictures! We make the Mango Rice in couple of ways. The recipe that I have already posted uses coconut and green chili paste, while today’s is a simple version of Mango Rice. Wash, soak the rice for 15 mins. Cook rice separately and cool. Wash and pat dry the mango, peel off the skin from the mango. Grate and keep it aside. Heat oil in a pan and add mustard seeds, Urad dal, channa dal, cashewnuts and raw peanuts and saute. Stir for couple of secs, add hing, red chillies, green chillies and curry leaves. Stir couple of times and make sure the peanuts are cooked. Next add the grated mango and fry in oil for 5 – 6 minutes until the oil starts coming out. Also add some salt and turmeric powder. Finally add rice, salt if needed and mix gently until it is well coated. Wow they did a wonderful job, else we would have missed all those yummy feast clicks.. 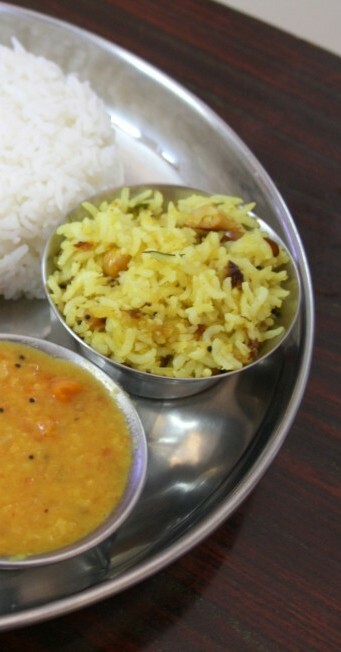 Even mango rice are my favourite,lovely dish. Nice to know that your family supports u a lot for Blogging,great! 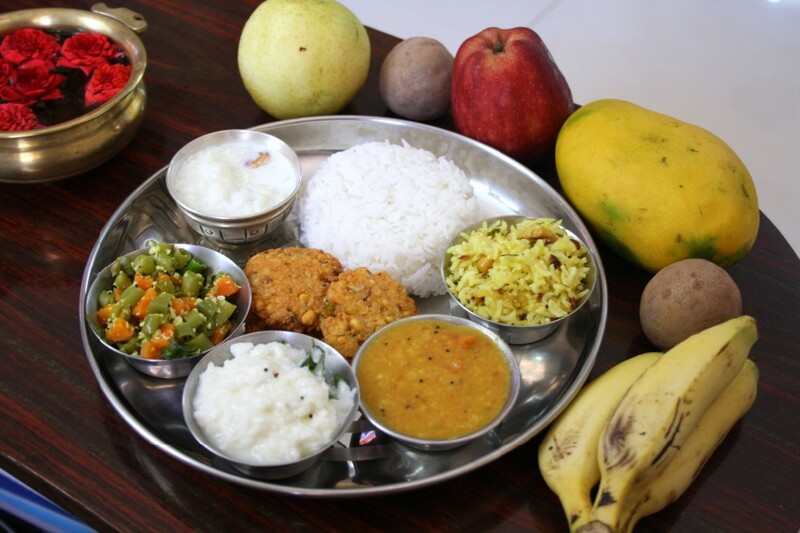 Wonderful spread…we too make mango rice similar way!! I understand why this thali is so sweet.. It is wonderful to have such a supportive family..
they did a wonderufl job!…all the dishes look great and mamidi pulihora – yummy to the highest point! i love manga sadham :).. such a sweet gesture from your hubby & dad's are always the sweetest .. how thoughtful indeed ! Lovely Spread valli!!! So cute, that ur whole family is into this!!!! Lovely!!! That's so sweet of your hubby and dad! My hub often helps me in cooking and clicking for the blog and it becomes so much more fun then 🙂 love mangai sadam…apt for the season! That's so sweet of your family. The pics have come out very well. It is so wonderful to have such a supportive family. Awesome spread..
Wow..that's a lovely Team Work ..! !Thali looks very nice..Guess it's been a year i have made Manga Sadam! !Loved it. All the pics look great. 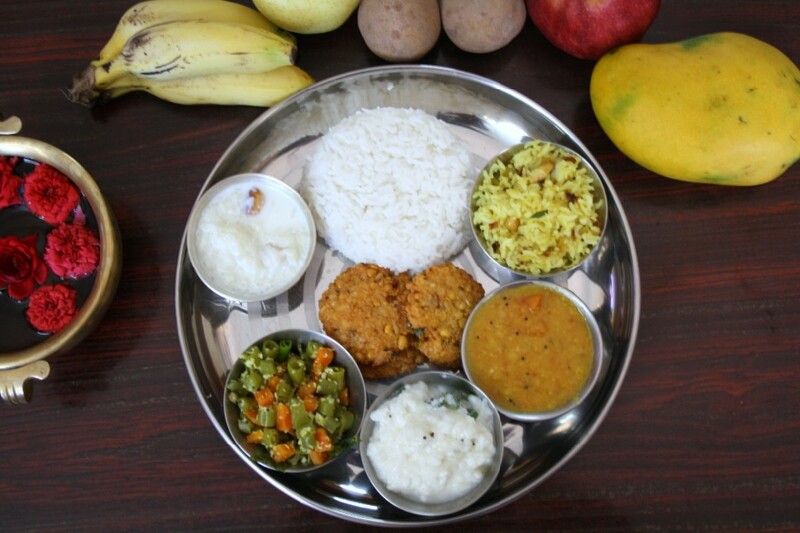 Thali looks delicious. Three cheers to your wonderful family!! very simple recipe which we all love. Good to know that the whole family is supporting your blogging. Great platter! And i love Mango rice. Cna't wait to make some as I am seeing mangoes in the supermarkets now. You must say thanks to you dad and hubby Valli see how beautifully they done for you.beautiful presentation. Mango rice is my alltime favorite. wat a wonderful feeling …feels grt wen one has that much support! !..lovely mango rice!